Find a way for a knight to visit every square on a board exactly once, and then solve a problem for a city tour guide. In doing so, find out what computational thinking is all about. See how algorithms are at its heart, allowing computer scientists to solve a problem once, and then - as long as they have checked it carefully - avoid having to think about it ever again. See why computer scientists think hiding things makes their life easier, especially when they find a good way to represent information, and how an ability to match patterns lets the lazy computer scientist do no more work than absolutely necessary. Oh, and finish off by advising a tourist information centre using some logical thinking. Perhaps surprisingly, computer science is not just about computers: it is about computation, and that crops up in all sorts of situations. Above all, it is about thinking in a completely different way. 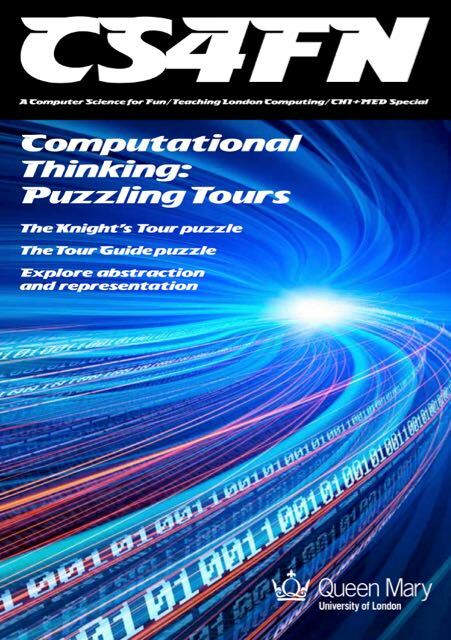 Find out what they have to do with computational thinking by downloading the cs4fn booklet, 'Computational Thinking: Puzzling Tours'.